The kantele is the Finnish version of an instrument known throughout the world as either a zither or lap harp. The Finnish kantele is basically a triangular shaped sound box with strings running across the top of the instrument. When the strings - usually tuned to a diatonic scale - are plucked, a kantele will produce ringing bell-like tones. It is similar to a harp in some ways, but because of the way in which it is built and the way in which the strings are attached, a compelling and unique sound is produced as it is played. Kanteles are often divided into two categories: small ones and big ones. Small ones rarely have more than two octaves. The big ones usually have at least 32 strings and three to four octaves. Kanteles, especially the smaller 5 and 10 string instruments, are relatively easy instruments to learn to play. The larger kanteles of up to 36 strings require more effort to learn to play, but allow the player to perform more complex pieces of music. The kantele - a plucked stringed instrument of the worldwide zither family - is a traditional folk music instrument that has been played in Finland and other Baltic countries since pre-historic times (see also the Ancient Lithuanian Kanklës website with drawings of kanteles and other Baltic Psalteries). The earliest references are found in ancient Finnish poems. In these poems the origin of the kantele is attributed to a mythical Finnish sage and shaman by the name of Väinämöinen. The first one he built was made of the jawbone of a giant fish and the strings were made from the long hair that young Finnish women willingly gave to him. That original kantele had only five strings and like so many that were made and played up until the 17th and 18th centuries, was used to accompany the singing of traditional Finnish poems and stories. When European music became more popular in Finland, kantele makers and players began to add more strings to their instruments so that these newer types of music could be played on kanteles also. Eventually instruments of up to 36 strings became common. During the revival of traditional folk music in Finland beginning in the 1950s and continuing until now, thousands of Finns took up playing the different sizes of kanteles - especially the 5-string, 10-string and 36-six string versions of the instrument. When Finns came to North America at the turn of the 20th century, a few immigrants brought these larger kanteles with them. The stories of over twenty of these Finnish immigrants who played or made kanteles have been documented by Joyce Hakala, kantele player and historian. In the last twenty years numerous groups and individuals have rediscovered the joy of playing kanteles in the United States and Canada. Among these newer players and teachers are Melvin Kangas in upper Michigan; Merja Soria in southern California; Diane Jarvi in Minneapolis; Wilho Saari and Cathy Cushing in the state of Washington; Tiina Heimonen in Thunder Bay; Joyce Hakala and her group Koivun Kaiku in St. Paul; Kasha Breau in New England; Sylvan Grey in Arizona; Barb Hanka in Duluth; and player and kantele scholar Carl Rahkonen in Pennsylvania. 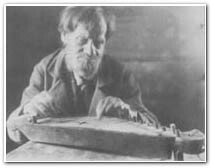 Jaakko Kulju from the village of Parkinselkä in Suojärvi, photographed in 1917 playing a 9-string kantele. Kulju also played a larger 16-string kantele, during which he moved his fingers from one string to the next. Photo by A.O. Väisänen, Museovirasto/National Board of Antiquities. "The player's fingers [touched] the strings according to the tune, but his eyes [did not] follow the activity, gazing blankly at the air in front of him. As the old man from Suojärvi continued to play his endless 'summer hymn' I took a photograph, exposing the frame for a rather long time, and marveled at how he did not blink at all, nor pay any attention to my photography whatsoever. He had lapsed into his world of quiet strumming. Gradually, as the same tune continued with most subtle of variations, his body began to slump against the table, his eyelids closed, the old man played as if in his sleep. Although I listened with the ear of a seasoned observer, I felt myself being cast under a spell. After this experience I was easily able to believe Old Man Onoila when he told me of one Karelian man who played so sadly that he made his listeners cry, and so joyfully that he made them dance...."